Editor-in-Chief Dr. Huishan Wan, University of Nebraska-Lincoln, USA. Journal of Administrative Sciences and Policy Studies is a peer-reviewed journal that publishes the best theoretical and empirical papers on organizational studies from dissertations and the evolving, new work of more established scholars, as well as interdisciplinary work in organizational theory, and informative book reviews. The journal is devoted to academic and professional public management and public administration. It focuses on comparative and international topics. It encourages reflection on international comparisons, new techniques and approaches in governance, the dialogue between academics and practitioners, and debates about the future of public management and public administration. 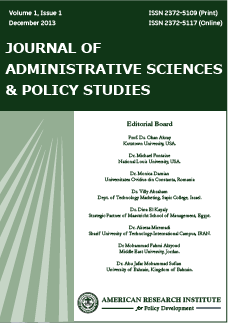 Journal of Administrative Sciences and Policy Studies also encompasses issues and practices in policy analysis and public management. The target contributors are economists, public managers, independent researchers, academicians and operations researchers. The journal follows double-blind peer review process. Each paper published in Journal of Administrative Sciences and Policy Studies is assigned a DOI®number, which appears beneath the author's affiliation in the published paper. Click HERE to know what is DOI (Digital Object Identifier)? Click HERE to retrieve Digital Object Identifiers (DOIs) for journal articles, books, and chapters. Dr. Huishan Wan, University of Nebraska-Lincoln, USA. Prof. Tryfon KORONTZIS, Dept. of Local Government, Hellenic National School of Local Government, Greece. Dr. Mehmet Mercan, Faculty of Economic and Administrative Sciences, Hakkari University, Turkey. Dr. Sharmayne Saunders, University of the West Indies Open Campus, Belize. Dr. Ozgur TOPKAYA, Canakkale Onsekiz Mart University, Turkey. Dr.Tariq Shareef Younis, Administrative Science College, Applied Science University, Kingdom of Bahrain. Dr Ahmad Aref Karim Almazari, Dept. of Administrative Sciences, King Saud University, Kingdom of Saudi Arabia.